Congratulations to two EPECentre team members who won awards at the recent EEA conference held in Wellington from 22-24 June. 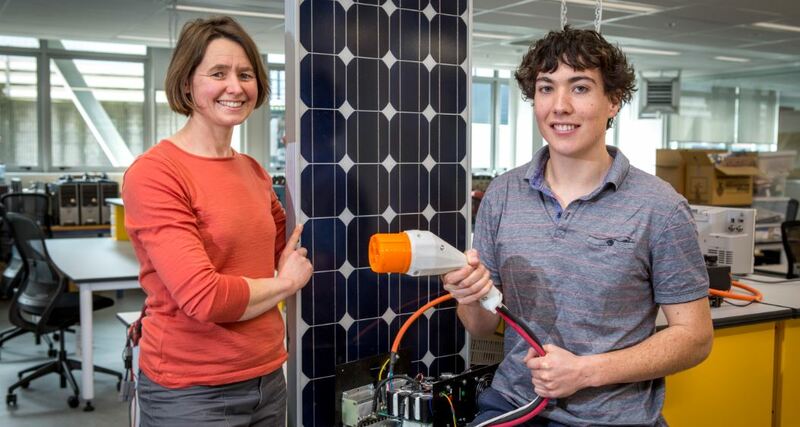 Ben Jar won the best student paper award, for his paper on electric vehicle rapid chargers, and Dr Sharee McNab won a merit award in best paper for her presentation of a paper investigating the economics of photovoltaic solar power by region in New Zealand. Ben Jar worked with the GREEN Grid team at the EPECentre on a summer scholarship, supervised by Dr Allan Miller and Professor Neville Watson, building a rapid DC charger for electric vehicles. The project was also supported by Northpower who purchased the equipment for the charger. Dr McNab is a senior research engineer with the EPECentre, and co-wrote a paper with EPECentre Director, Dr Allan Miller, investigating the economics and potential uptake of PV solar power in New Zealand regions. The EPECentre had a large presence at the conference, with 10 papers on GREEN Grid topics, which in addition to the above papers, included a paper on a new guideline for connecting PV solar power to the grid, a tool developed by the EPECentre to enable electricity distribution companies understand how much PV solar power local networks can accommodate, power quality trends from new technologies, and a model for use in future GREEN Grid investigations into the impact of wind generation on grid stability. GREEN Grid is a six year research programme to look at increasing the amount of renewable energy in New Zealand. It is funded by the Ministry of Business Innovation and Employment, Transpower and the EEA. The University of Canterbury EPECentre is the lead researcher in the project, led by Dr Allan Miller. Dr Sharee McNab and Ben Jar.